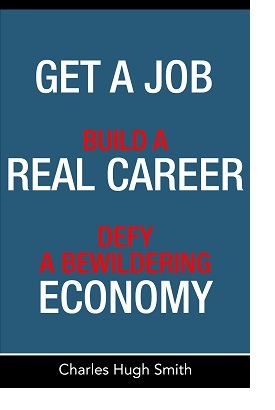 oftwominds-Charles Hugh Smith: How Recession-Proof Is Your Job Sector? History suggests that previously sound assumptions about financial security and recession-proof sectors may not apply in the next recession. Nobody wants to lose their job in a recession, but that's what happens when credit tightens, profits fall and tax revenues decline. Every enterprise that can't borrow unlimited sums of money at near-zero interest rates has to cut costs, and since labor and labor overhead (pension contributions, healthcare insurance, etc.) are the biggest expense for the vast majority of enterprises (including government agencies), payroll must be trimmed one way or another: either by lay-offs or by attrition, i.e. not hiring replacements for workers who retire or quit. Some sectors are highly sensitive to the economic cycle. Courtesy of Market Daily Briefing, here is a chart of each primary job sector's gains and losses over the past decade. 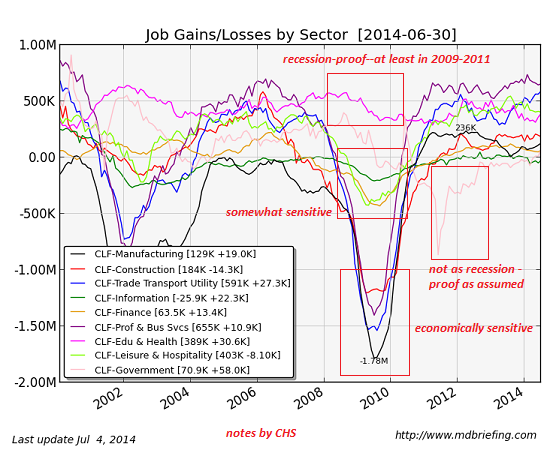 I have added boxes to identify the sectors most sensitive to economic contraction (i.e. recession) and those that are less sensitive. The most recession-proof sector is (no surprise here) Education and Health.Manufacturing, transportation and construction are highly sensitive, as any credit hiccup quickly cuts into auto and home sales, which then cuts into the transport of raw materials and finished goods within these sectors. Though government employment is generally considered rock-solid due to the job security provisions of civil service and public union contracts, as a sector, government isn't quite as recession-proof as is widely assumed. Government on all levels (Federal, state and county/city) subcontracts many services, and government payrolls can be trimmed by attrition. 1. What if the Federal Reserve's monetary easing fails to pull the economy out of the next recession? 2. What if structural changes are eroding the recession-proof sectors? In other words, what might be different in the next recession? The reason why these questions arise is the Federal Reserve has already pursued extraordinary policies to the point of exhaustion. The Fed has not just emptied its bag of tricks during the past six years since 2008, it has run these policies to the point of diminishing returns: interest rates can't go any lower, the Fed already owns much of the Treasury bond market and mortgage market, it continues to intervene in capital and stock markets, and so on. The Fed did not flood the U.S. and global economies with free money and credit and then withdraw this unprecedented intervention: it has kept its foot on the accelerator for six long years. Only now that its monetary heroin is triggering blowback in various global markets is the Fed tapering a bit of its massive interventions. But the question remains: given that the Fed has gone all-in for six long years, what's left for it to do in the next recession that isn't even riskier than its current all-in gamble? Though many seem to have fallen for the Fed-induced fantasy that business cycles and credit cycles have been banished and the stock market and economy can both loft higher forever, the reality is that flooding the economy with cheap credit and buying assets to inflate asset bubbles have only guaranteed the next turn of the credit cycle will be more disruptive than previous turns, as the quality of the debt that's been issued is even more marginal than in previous expansions. This is why Gordon Long and I consider this a Subprime Economy: the expansion is all based on increasingly marginal borrowers and marginal debt. In effect, the Fed has extended the financialization process to the point that the entire economy is increasingly dependent on subprime credit/debt that is highly sensitive to any decline in income and asset prices. In effect, the Status Quo has no response to this heightened vulnerability to collapse of the credit bubble. The Fed's monetary heroin does not address the need to rationalize the bloated, wasteful, inefficient sources of malinvestment and unsustainable spending: higher education, healthcare (the previously recession-proof sectors) and government spending based on cronyism and politically sacrosanct fiefdoms (such as defense spending). Yet such rationalization is unavoidable. I highly recommend this recent article in Foreign Affairs on the larger context of jobs and bloated sectors that have been protected from innovation, competition and transparency: Labor, Capital and Ideas in the Power Law Economy. History suggests that previously sound assumptions about financial security and recession-proof sectors may not apply in the next recession. That means each household will have to look after it's own financial security rather than blindly rely on assumptions which may not hold in the next credit contraction. In my view, the only "recession-proof" income is one you own and control, preferably drawn from a variety of sources so it is not too dependent on any one sector or on the doomed expansion of marginal debt and asset bubbles. Thank you, David K. ($100), for your outrageously generous contribution to this site -- I am greatly honored by your steadfast support and readership. Thank you, Brian C. ($10), for your most generous contribution to this site -- I am greatly honored by your support and readership.